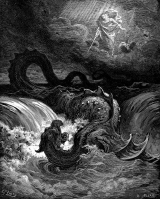 The snake has been a powerful image for humanity from the earliest times: perhaps the strongest image is that of Leviathan, the giant sea-serpent. The word 'leviathan' in Hebrew means approximately "that which gathers itself into folds" or "that which is drawn out". There is much confusion about the translocation of the word in its Biblical context, however, and theologians have to differ about its meaning, though the general idea is that it refers to some huge animal, almost certainly linked with water (Fred Gettings, Dictionary of Demons, 1988). In Psalm 74, A complaint born of faith, the animal is regarded as a food source. The ‘dragons’ referred to here are thought to be crocodiles. Then answered I and said, What shall be the parting asunder of the times? or when shall be the end of the first, and the beginning of it that followeth? And he said unto me, From Abraham unto Isaac, when Jacob and Esau were born of him, Jacob's hand held first the heel of Esau. The hand of man is betwixt the heel and the hand: other question, Esdras, ask thou not. I beseech thee, shew thy servant the end of thy tokens, whereof thou shewedst me part the last night. So he answered and said unto me, Stand up upon thy feet, and hear a mighty sounding voice. And it shall be as it were a great motion; but the place where thou standest shall not be moved. And therefore when it speaketh be not afraid: for the word is of the end, and the foundation of the earth is understood. And why? because the speech of these things trembleth and is moved: for it knoweth that the end of these things must be changed. And it happened, that when I had heard it I stood up upon my feet, and hearkened, and, behold, there was a voice that spake, and the sound of it was like the sound of many waters. And the children of a year old shall speak with their voices, the women with child shall bring forth untimely children of three or four months old, and they shall live, and be raised up. And tha trumpet shall give a sound, which when every man heareth, they shall be suddenly afraid. At that time shall friends fight one against another like enemies, and the earth shall stand in fear with those that dwell therein, the springs of the fountains shall stand still, and in three hours they shall not run. Whosoever remaineth from all these that I have told thee shall escape, and see my salvation, and the end of your world. For evil shall be put out, and deceit shall be quenched. As for faith, it shall flourish, corruption shall be overcome, and the truth, which hath been so long without fruit, shall be declared. And when he talked with me, behold, I looked by little and little upon him before whom I stood. And these words said he unto me; I am come to shew thee the time of the night to come. If thou wilt pray yet more, and fast seven days again, I shall tell thee greater things by day than I have heard. For thy voice is heard before the most High: for the Mighty hath seen thy righteous dealing, he hath seen also thy chastity, which thou hast had ever since thy youth. And hasten not with the times that are past, to think vain things, that thou mayest not hasten from the latter times. And it came to pass after this, that I wept again, and fasted seven days in like manner, that I might fulfil the three weeks which he told me. And in the eighth night was my heart vexed within me again, and I began to speak before the most High. For my spirit was greatly set on fire, and my soul was in distress. And I said, O Lord, thou spakest from the beginning of the creation, even the first day, and saidst thus; Let heaven and earth be made; and thy word was a perfect work. And then was the spirit, and darkness and silence were on every side; the sound of man's voice was not yet formed. Then commandedst thou a fair light to come forth of thy treasures, that thy work might appear. Upon the second day thou madest the spirit of the firmament, and commandedst it to part asunder, and to make a division betwixt the waters, that the one part might go up, and the other remain beneath. For as soon as thy word went forth the work was made. And gavest them a charge to do service unto man, that was to be made. Upon the fifth day thou saidst unto the seventh part, where the waters were gathered that it should bring forth living creatures, fowls and fishes: and so it came to pass. For the dumb water and without life brought forth living things at the commandment of God, that all people might praise thy wondrous works. And didst separate the one from the other: for the seventh part, namely, where the water was gathered together, might not hold them both. But unto Leviathan thou gavest the seventh part, namely, the moist; and hast kept him to be devoured of whom thou wilt, and when. And after these, Adam also, whom thou madest lord of all thy creatures: of him come we all, and the people also whom thou hast chosen. As for the other people, which also come of Adam, thou hast said that they are nothing, but be like unto spittle: and hast likened the abundance of them unto a drop that falleth from a vessel. And now, O Lord, behold, these heathen, which have ever been reputed as nothing, have begun to be lords over us, and to devour us. And led his chosen armies thro’. Amidst these wat’ry nations, Lord! Bold men, refuse their Maker’s praise. They curse the hand that smoothes the tide. Nor own the God that rescu’d them. That there’s a God that rules the sky.